As an old friend used to say, “Price changes create their own news flow.” This is a good way to think about all the “stories” that have surfaced lately explaining the unexpected plunge in bond yields this year. 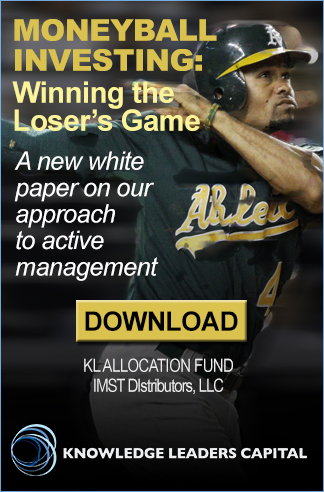 In our mind, there are four really simple charts that explain the movement in long bonds this year. 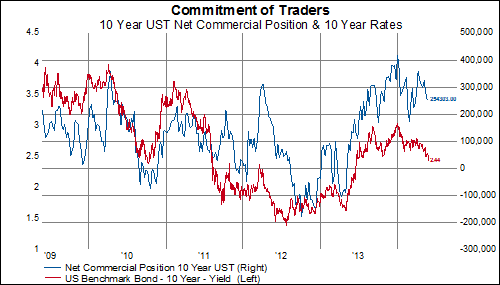 First, commercial traders–the so-called smart money–are holding a large long position in 10 year US Treasuries/ In the chart below, it is easy to see the huge shift in bond positioning by commercial traders in the last 18 months. 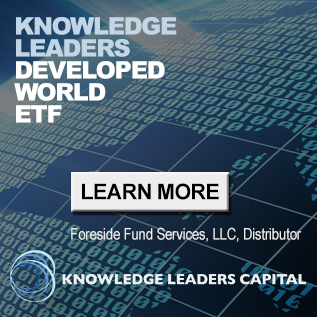 In the fall of 2012, they were short almost 200,000 contracts, and now they are long just over 250,000. Second, the taper is still the elephant in the room. 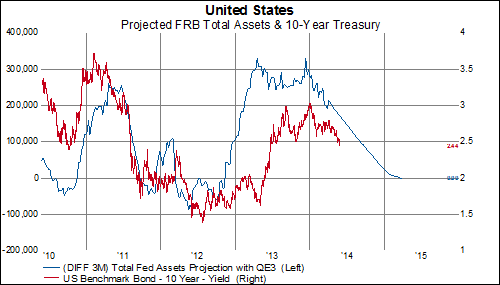 In the chart below, we model the Fed’s tapering scenario, looking at the three month rate of change in Fed total assets. By March of 2015, if the Fed maintains its $10/meeting taper schedule, the three month accumulation in assets will total zero. We plot 10 year US Treasury bonds alongside this taper temple to highlight not only the close relationship between rates and Fed asset purchases, but also to illustrate the glide-path to lower rates the taper template suggests. Third, while expectations for the Fed to complete the taper remain on schedule, expectations surrounding the vigor of their expected rate raising campaign have softened. 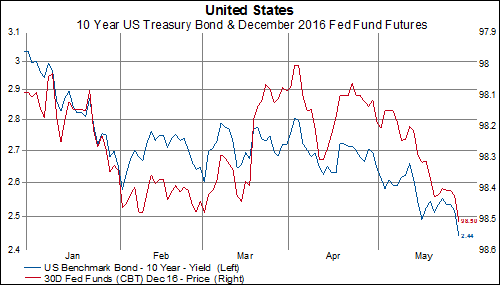 The chart below compares the 10 year US Treasury bond to December 2016 Fed Funds futures. In April, before the recent slide in rates began, expectations embedded in the Fed Funds futures suggested market expectations of 2% fed funds rates by the end of 2016. The recent rally in this contract, from 98 to 98.5, now suggests that investors are expecting 1.5% fed funds rates at the end of 2016. Fourth, interest rates historically have a decent relationship with lumber prices. The logic is easy: lumber is a proxy for the strength of housing; housing is proxy for the strength of the economy; so weakening lumber prices suggest a weakening economy and opens the door to lower rates. 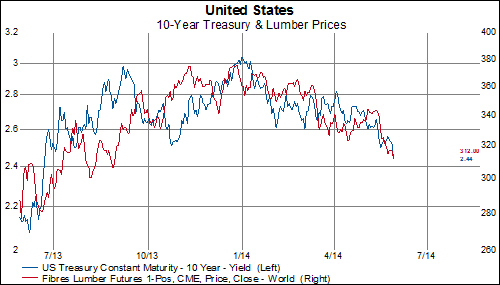 For the last year, lumber and rates have been joined a the hip. The breakdown in rates has occurred simultaneous to the breakdown in lumber.